I could eat avocados every day! 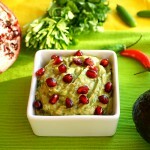 Here is another idea for a delicious, creamy guacamole! Pomegranate seeds give the dish a bright color and slightly sweet kick. If you are a lover of spicy food, you can use the seeds from the serrano. 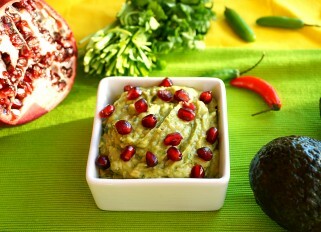 And if you add a little bit olive oil, then you’ll get a very smooth guacamole. 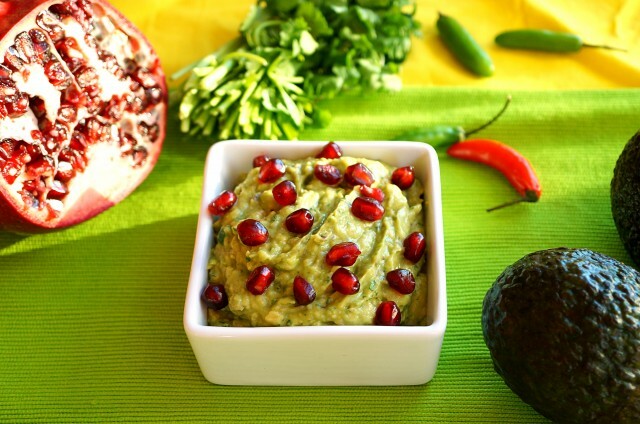 It wouldn’t be Cinco de Mayo season without a good guacamole. This looks so beautiful and it’s so yummy! Crush the chopped onion, serrano, cilantro leaves in a mortar into a paste then transfer to a bowl. Mash with a fork half an avocado and the second half cut into small cubes. Mix everything together gently, add the lime juice, garlic powder and salt, mix gently again. Decorate with pomegranate seeds in a top.